Here's a familiar sight for this time of year. A thoroughly trampled bunker and some of my staff out hand watering fairways. We've been so busy trying to get caught up yet, we are just at the beginning of what's bound to be one of the busiest summers in our long history. Membership is the highest it's been in ages and today's membership is a very "golfing" membership. Don't get me wrong, nothing makes me happier than seeing golfers enjoying the playing field at Tacoma. At the same time, nothing is more frustrating than seeing some of the unnecessary damage caused by golfers which only makes the golf experience less enjoyable for everyone. I'm not really talking about ball marks and filling fairway divots. 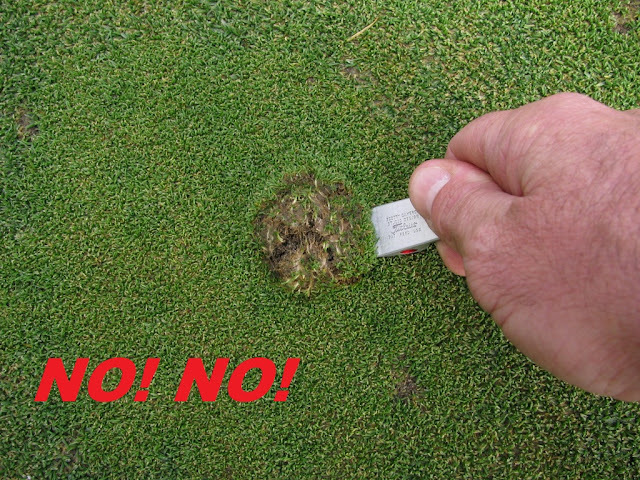 I'm pretty sure everyone is tired of hearing the same old lecture about the proper way to fix ball marks and lets face it, some people fill divots and some people don't. So, I'm not going to talk about ball marks but if you haven't seen the video I made several years back, you should watch it since It's still very relevant today....click HERE. When it comes to filling fairway divots, we have so many people that love to fill divots that it kind of makes up for the people that don't like to fill divots. ...........this is a really good picture. Almost everyone that hit in this area tried to hit in strips thereby reducing the amount of turf consumed. Maybe this is obvious but I'll point out that when you consume less turf, you leave behind more turf. This means the next time you go out to hit golf balls on the practice tee, the more likely it is that you will find some nice turf. 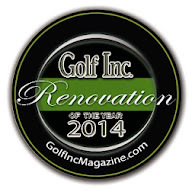 In addition, the less turf consumed, the less time and money we spend repairing the damage which means more time and money we can use elsewhere to improve your golfing experience. I understand that some people simply just don't know how to take divots properly. That's really the bottom line. It's about education. Again, if you haven't seen it, watch this video I made back when I had less gray hair......click HERE. Lastly I need to touch on something that I haven't spoke much about, but is of growing concern. We all know Tacoma may have the best bunkering on the planet, but these bunkers are taking a beating, and it's caused by the golfers..............the one group of people that you would think "care" about the condition of the bunkers. What I'm talking about is one very basic rule of bunker etiquette, but at Tacoma this simple rule is even more important. The rule is "Enter and Exit the bunker properly". Check out this bunker face on #9 green. Someone decided to enter the bunker or exit the bunker in this area and they collapsed the face of the bunker. Now we have a condition which needs repair. This kind of repair is something we do not have time for this time of year so it will just remain this way for quite some time. The problem is that before this damage occurred we had a bunker face which released the golf ball properly. Now we have a bunker face which may swallow up a golf ball and create an unplayable lie like in this picture. This is a reality at Tacoma. Our bunkers are true hazards and if you play here you will find that you need to deem the ball unplayable from time to time. I call that golf. It's much more interesting and exciting golf when the price of a bad shot can be very costly. I can't stand the modern type of golf I see where being in a bunker is no penalty at all or even worse, being in a bunker is the better lie than not being in the bunker. With that said, none of us want to deem our ball unplayable. It is a very costly price to pay. Missing a green by a few feet should simply mean that more often than not, your going to have to pull off a good recovery shot to make par. I'm seeing more and more of this type of damage because people can't take that extra few seconds to use the low side of the bunker for entering and exiting. Before you know it, the unplayable lie might become the norm. None of us want that. Please people, enter and exit properly! Enter and exit at the low side of the bunker.